Pawhuska, Okla., Osage Reservation (Thursday, August 16, 2018) –Nine years ago, an effort started to bring Osage culture and history to a modern Osage Nation. This year, the 10th Annual Cultural Encampment in October, hosted by the Wahzhazhe Cultural Center (WCC), will be celebrated on reclaimed Osage ancestral homelands, the 43,000-acre Osage Nation Blue Stem Ranch. “Our people walked from the Ohio basin to what is now the Osage Reservation. Over the past nine years we have experienced what the journey might have been like for our ancestors from Eastern Kansas. This year on the tenth anniversary of this cultural family event we are excited to announce a new adventure. 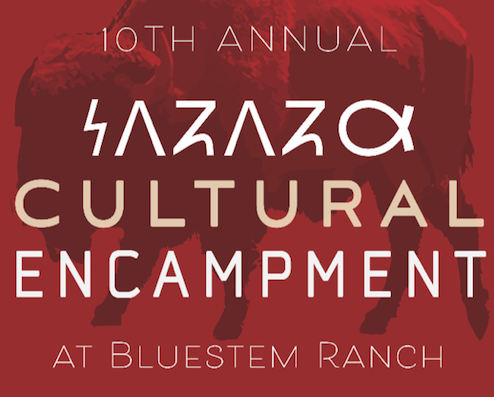 Please join us for the 10thAnnual WahZhaZhe Cultural Encampment at our very own Bluestem Ranch,” said Addie Hudgins, WCC Director. The event consists of an overnight campout and cultural activities, “to bring insight and knowledge to our WahZhaZhe people [that] we are descendants and survivors of a great nation….to experience on a very basic level our history and culture through modern eyes.” This message, from the Osage Nation website, has been the purpose and intent since the first cultural journey nine years ago. “Since the conception of this annual event we have been looking for ways to make it better and progress. We feel this is a great time to move forward and make great use of the beautiful land we as a nation now own again,” said Hudgins about celebrating the annual Osage cultural gathering with an encampment on reclaimed homelands. The Mission of the WahZhaZhe Cultural Center (WCC) is to ensure the survival of the WahZhaZhe Nation of people, we will share, preserve, and celebrate the values, teachings and tribal ways that our elders entrusted to present and future generations. Our Strength will come from the commitment of our WahZhaZhe people and the knowledge that the WahZhaZhe Nation is blessed by WaKonDa.